When describing my middle school cross country years, one question most people have is, "There's a state meet for middle school?" Of course, the answer is yes. Every year IESA hosts a state meet, and it's no easy feat to get there. It's even harder to win, but current freshmen Spencer Werner of Loyola Academy and Katrina Schlenker of Batavia pulled it off in 2018. In fact, Schlenker is a two-time IESA State champion, covering the two-mile course in 10:57.7 during her eighth-grade year. Spencer Werner followed with a speedy 10:15.4. Both athletes made the decision to continue their running careers in high school. If you ask any athlete who ran in middle school, they would tell you that running in high school is a completely different level. Nobody would understand this transition better than Werner and Schlenker, so we decided to ask them a few questions. 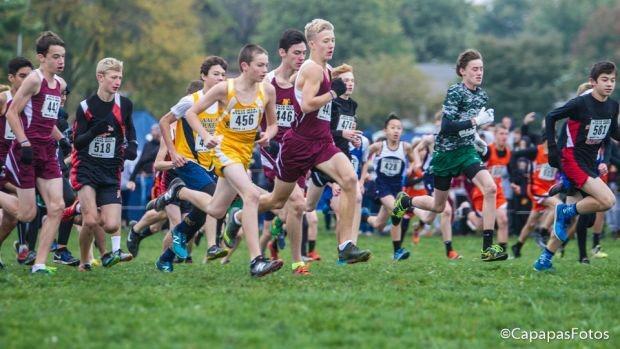 One of the main differences in high school cross country is the jump to a three-mile race distance, and a competitive freshman must adjust to this change in their training plan. Schlenker explains how she did this: "My coach had me and my teammates ease into the long mileage starting off at six [miles] the first long run day to get back into the swing of things. Towards the end of summer, my longest run was 10 miles." Those long runs clearly paid off, as Schlenker ended up taking second at her first high school state meet, something not many freshmen have accomplished. Werner took a different approach, as he continued to compete over the summer, "I was training all summer for the USATF and AAU Junior Olympics in track, which I competed in at the end of July." Besides the difference in mileage, there are many changes that come with running in high school. Both athletes felt this change in their teammates, noting that they really bonded with their teams, even though they were some of the youngest (but fastest) athletes there. Werner loved the camaraderie of his team, and Schlenker enjoyed spending more time with her teammates, especially compared to the previous "occasional pasta party." When asked if they wished they had done anything differently during their middle school years to prepare for the road ahead, Schlenker commented, "I would definitely not change my middle school years or cross country. I think every mistake I've made I have been able to grow from. My middle school running was an amazing experience." While it is safe to say that Werner also had three outstanding seasons in middle school, he still wishes that he had taken "more frequent, longer runs." Schlenker enjoyed the intense workout schedule that high school brought, but that same intensity is what ended up hurting Spencer Werner the most when he got a stress fracture in the middle of the season. Even though he said that his sectional meet was when he most felt his injury, he managed to PR with a fantastic time of 15:45.4. Looking back, he wished that he had taken more time off between Junior Olympics and the cross country season. While both athletes felt similarly about many topics, they had different advice for young athletes considering track and cross country. Werner emphasized hard work, "Always do extra, focus on the little details, that makes the difference. Just keep at it." On the other hand, Schlenker focused on the big picture, "It's an amazing experience and you get to learn so much to get excited. Just stay focused when you need to be but also enjoy the transition and the challenges that come with it because that is how you grow as an athlete." Katrina Schlenker and Spencer Werner are both planning on running track in the 2019 season, so make sure to keep up with them!